Flash, bang, wallop – what a triumph indeed! 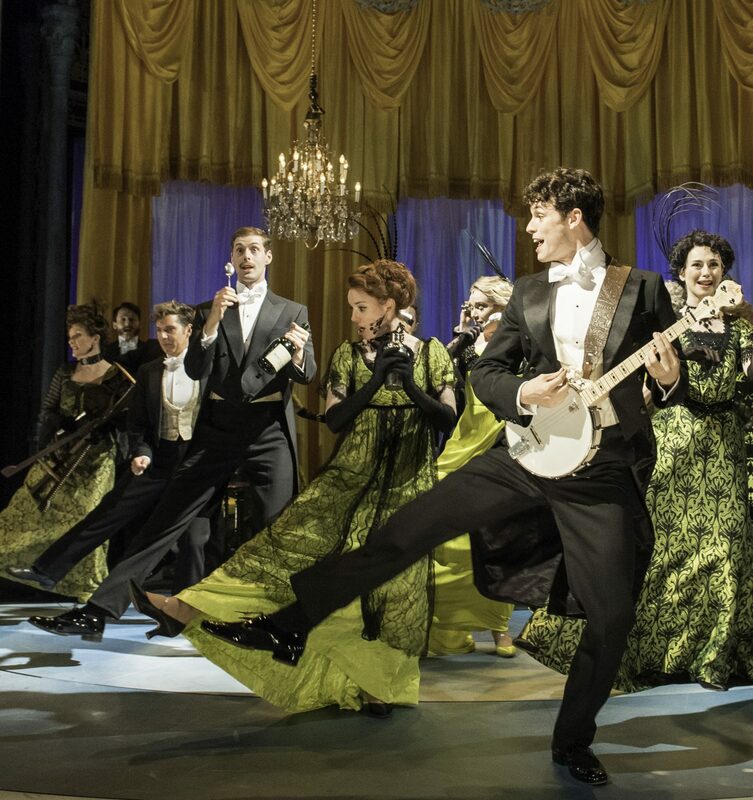 After a critically acclaimed stint at the Chichester Festival, Half a Sixpence has bounded onto the West End stage with grace, sophistication, and also a bit of rowdy, boisterous fun. The story sees shop assistant Arthur Kipps thrust into the higher classes after inheriting his grandfather’s wealth. Now a gentleman, he is caught up in a whirlwind of money and power, soon finding himself torn, not only between the life he once had and his new existence, but also between two very different women that gain his heart. This truly is a delightful classic that’s not afraid to take risks for a modern audience. The music may be vintage but this contemporary reimagining, orchestrated by William David Brohn, brings the score into the 21st Century like never before and the sound coming from the stage is exquisite. The stand-out numbers just keep coming – you think you’ve found a highlight then another song appears that makes you lean a little further forward in your seat. Pick Out a Simple Tune and the scene in the garden party are superb, but Flash Bang Wallop (What a Picture) is the obvious outstanding piece, rightly finishing the show with flair. One of the most ground-breaking parts of the production is Andrew Wright’s imaginative and intricate choreography – simple movements and complicated dance are brought together to create a wonderful visual spectacle with almost every number. Paul Brown’s staging is seamless, with a largely stripped-back moving set and turntable that create a really fluid show. That and the soundtrack sustain a buzzing energy that never falters. At the heart of it all, Charlie Stemp gives the audience an Arthur Kipps brimming with energy and endearment. He is a natural charming presence on stage and performs with ease. He dances with such expression and creates believable relationships that pull you into the story, winning your affection. He is without doubt the West End’s newest star. The story is a little predictable, and I would have liked to have learnt more about Arthur’s family and the mysterious inheritance, which is touched upon but never explored. However this show is sold by a widely talented, expressive cast who bring Stiles and Drewe to a modern audience without apology. Half a sixpence may be better than half a penny but you should give all your pennies for a ticket to this triumph. A new West End gem with old fashioned fun that will have audiences on their feet for weeks to come. Half a Sixpence is at the Noel Coward Theatre, currently booking until 11th February 2017.